THE explosive rise in ration ingredient prices over the past couple of months has pushed results in Beef Central’s latest grainfed trading budget deep into loss territory – but the financial impact has been moderated somewhat by declining feeder cattle prices. Drought across eastern Australia has pushed not only feedgrain, but other ration ingredients including hay and cottonseed dramatically higher since June, as lotfeeders face heavy, if unfamiliar competition for already scarce feedstuffs from graziers. Record numbers on feed reported last week (see earlier report) have only served to intensify competition for available feedstuffs. Driven by spiralling commodity prices, Beef Central’s latest monthly 100-day grainfed trading budget compiled this morning using our standard set of variables (see list at base of page) shows a loss of $138 a head. That’s deteriorated from a $62 loss in our previous budget calculated in early July. The regular calculation is based on a typical flatback feeder steer entering a Darling Downs commercial feedyard today, and closing out for slaughter after 105 days on feed on December 4. While today’s result represents a significant deterioration on our previous July result, it’s still a long way from this report’s record $155 loss reported in February, when feeders were worth 280c/kg; ration price was $370/t; but most significantly forward-sell grainfed carcase price was just 500c/kg due to tough global meat trading conditions. For today’s trading budget, research has led us to apply a feeder steer buy price (flatback steer, 450kg) of 265c/kg. That’s 5c below our last report in early July, but as recently as late July (in between our reports), steers meeting this spec were making 290c/kg, due to June rain in some areas, as the market started to chase itself. Today’s feeder price sits close to the lowest figure we’ve published for this report series since April 2015 (255c/kg), which was recorded just before the big surge started in store and finished cattle prices across Australia (see graph above). At its peak in June 2016, flatback feeders fitting our description were worth 360c/kg. That means a feeder purchased today is worth $427 less than it was at the market’s 2016 peak. Today’s feeder price of 265c/kg values our 450kg feeder at $1192, down from $1215 in early July. It will come as no surprise to hear that feedlot ration prices are now in uncharted territory. Quotes from Darling Downs feedlots this week were in a wide range, from around $400/t all the way to $525/t. Since the start of August, grain prices have seen around $100/t added to their value; perhaps $200/t to cottonseed; and hay much the same. 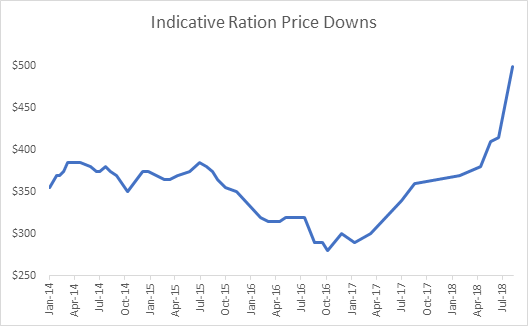 We’ve installed a $500/t ration price into today’s trading budget calculation, but it’s important to stress that the current state of affairs makes it more difficult than normal to pin down a reliable number. Today’s ration price is reflecting wheat ex downs in the $460-$470/t range. Another suggests that current pricing levels are over-cooked, perhaps carry an element of panic driven in part by widespread media exposure about the drought over the past month or so. As a result some anticipate that current prices may subside somewhat. They point out that a month or so ago, grain was being delivered by ship to Brisbane from the west at around $400/t landed Downs, but suddenly the same grain is costing $500/t. In simple terms, anybody looking for custom feeding space in southern Queensland yards currently could easily get a $100/t variance in ration price quotes within eight or ten yards, it appears. That figure will be influenced by how many cattle the yard has around them themselves, available pen space, and their own particular grain position. 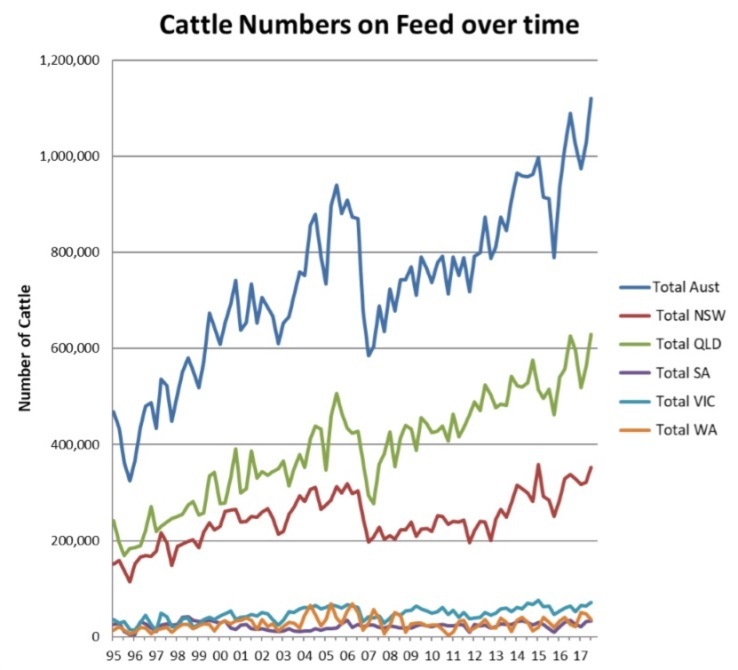 Evidence suggests there are an increased number of cattle on feed across Queensland at the moment under custom-feeding programs, and perhaps a larger than normal number of ‘non-traditional’ speculative feeders, a reliable source suggested. Today’s quoted ration price has pushed the total feeding cost per beast in our calculation to $783. That’s a big jump from our early July figure, when total feeding cost reached $650/head, when rations were worth $415/t. That delivers a total production cost per beast (using the variables listed at the base of this page) of $2079/head. Surprisingly, that total production cost figure is little different from July last year, when feeder cattle were still worth 320c/kg ($200 more than today), and rations worth $340/t. What happened the last time rations got close to $400/t? Looking back through history, there’s only been one short period around 2007 when feedgrain prices reached around $400/t. But other ration ingredients like hay and cottonseed certainly did not climb to the same level as they have today. 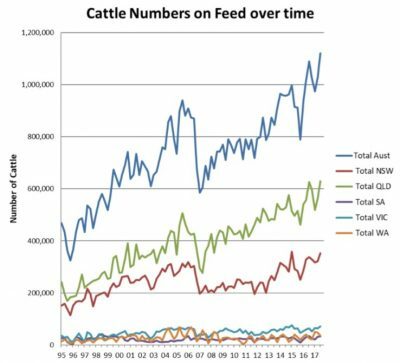 While it is difficult to establish a direct link, there was a clear and sharp decline in numbers of cattle on feed across Australia around that time (see graph). Much of that can be attributed to the Global Financial Crisis, but industry commentary at the time did reflect on the impact that record high grain prices were having on feeding activity. Cost of gain in today’s breakeven has reached a record 373c/kg – a dramatic rise from 310c/kg in our last report seven weeks ago. 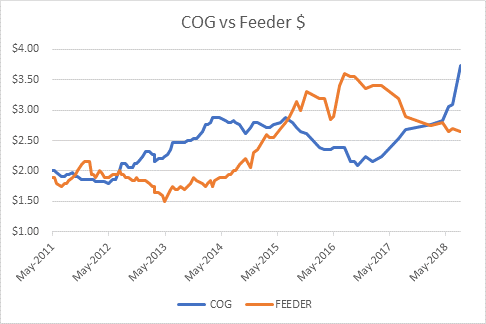 It clearly shows why lotfeeders have lost all interest in trying to feed lighter-spec cattle on to heavier weights – in stark contrast with 12 months ago, when feedlots were paying clear premiums for lighter cattle, due to a cost-of-gain being considerably cheaper than the purchase price of feeders. This time last year, feeders were worth $200 more that today, and ration price was well over $200/t less. All the above variables deliver a breakeven in today’s budget on our chosen feeder steer of 589c/kg – 31c/kg higher than our last report in early July, but much the same as this time last year, when the variables were dramatically different, but produced a similar breakeven outcome. Southern Queensland processors this week are offering forward contract prices for 100-day steers ready for slaughter early December of 550-560c/kg, 10c/kg higher than our previous report. The forward price figure is edging up towards the all-time high in this series of 600c/kg seen back in July 2016, when supply got very tight. Processing margins apparently remain solid, rather than outstanding, with global demand and favourable currency movements helping maintain some momentum. As stated in our intro, a 550c/kg forward slaughter price for early December delivery indicates a loss of $138 a head on today’s trading budget. However Beef Central often reminds readers in our breakeven reports, that profit/loss results on cattle will vary, depending on performance of cattle and chosen ration. While our chosen ADG of 2kg/day is representative of ‘middle of the road’ performance in Queensland feedyards, cattle performing 10pc better (2.2kg/day ADG), will produce a considerably lower breakeven figure, and better profitability outcome. The current spot market for 100-day cattle for southern Queensland slaughter is around 540c/kg, up sharply from 500-510c back in early July. Looking at 100-day grainfed ox being delivered to processors for slaughter this week, if those cattle were bought on forward contracts back in May, they were worth around 530c/kg, suggesting processors are currently 10c/kg or $35 better-off in kills this week on cattle they forward-bought earlier, compared with today’s spot market.